The process of starting a blast furnace after its construction or after its relining is called blowing-in. 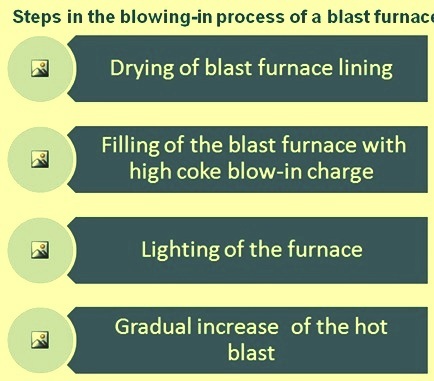 The blowing-in process is carried out in several steps (Fig 1) which consist of (i) drying out the lining, (ii) filling of the blast furnace with a specially arranged high coke blow-in furnace charge, (iii) igniting of the coke or lighting of the blast furnace, and (iv) gradually increasing the hot blast (wind rate) with frequent castings to ensure the raising of temperature of the blast furnace hearth. During the period of blow-in, the burden ratio (ratio of the ore to coke) is adjusted according to a predetermined schedule until the normal operation of the blast furnace is achieved and the blast furnace starts producing the normal quality of the hot metal. Newly constructed or relined blast furnace is to be carefully dried before the coke is ignited. It is because the large amount of water contained in the slurry used for refractory brick laying and the water absorbed by the refractory brick work is to be driven off as much as possible for avoiding extreme thermal shock. There is sufficient data available that blowing-in of a blast furnace can cause damage to the refractory lining even when it has been properly dried. Furthermore, if the water from these sources is not removed from the blast furnace before it is put into operation, it absorbs heat more than that provided for the blow-in charge and hence prevents the hearth from reaching the desired temperature. In such cases, hot metal and liquid slag entering the hearth can freeze there and in such case it becomes impossible to remove them from the blast furnace. There are several methods which can be used to dry a blast furnace and the hot blast stoves associated with the blast furnace. The normal method for hot blast stoves, where the gaseous fuel such as coke oven gas is available, is to put a gas pipe in the lower combustion chamber and start with a small flame and increase the gas input for many days until a small quantity of blast furnace gas can be used, keeping the gaseous fuel as a pilot flame. It is desirable to increase the heat slowly for at least ten days to two weeks in a new hot blast stove before starting to bring the hot blast stove up to the operating temperatures. Hot blast stoves which have had previous service have been warmed up in 36 hours to 72 hours without apparent difficulty. Another method of drying or heating in the past was to use a wood fire built in the bottom of the combustion chamber. The wood fire needed a constant attention until wall temperatures were sufficient to ensure proper combustion of blast furnace gas. One of the methods for the drying a blast furnace is the use of hot blast air. It is simple method and drying remains under control at all the times. In applying this method, the conventional hot blast system is used except that initially the blast temperature is held to around 200 deg C to 220 deg C and hot blast volume is held at a low blast level. The temperature is slowly increased over several days to slightly above 400 deg C and is maintained at that temperature level for a few more days. The entire operation can be accomplished in a week. At some places, elbows and pipes are installed inside a few of the tuyeres of the blast furnaces to direct heated air down to the blast furnace hearthIt is desirable, that during the latter part of the drying period, to use low pressure steam into the hearth cooling staves and bosh plates to assist drying. The lower sealing valve equipment of the top charging is closed while drying, and the furnace bleeders are adjusted to retain as much heat as possible within the blast furnace. No pressure reading need to be observed at the blast pressure gauge while drying. In plants with single blast furnace where blast furnace gas is not available, the method just described must be modified because an auxiliary fuel of either coke oven gas or fuel oil is to be used to heat the hot blast stoves. However, for the low level of heat required, this can be done satisfactorily. An alternative method for the drying of the blat furnace is known as the hearth fire method. It simply consists of a wood, coke or coal fire built in the hearth of the furnace and controlled similarly to the other methods with tuyere shutters and bleeders. It is difficult to regulate the fire temperature. Also frequent replenishment of fuel is required which is not only difficult but also it interrupts the process. If used for drying only, this method is as simple as described above, but it could be applied as the start of a controlled or slow blow-in process. A few blow-in operators claim that improved warm-up is achieved through this technique. After drying, a very heavy coke blank is charged, followed by a regular blow-in burden. A low blast is then maintained, and hearth and in wall temperatures are slowly raised before the volume of air blast is increased to conventional blow-in rates. In this method actual blow-in takes place after a lapse of several days. However theoretically, this method has the advantage in that there is less chance of damage to refractory brick lining from thermal shock and there is a reduced tendency for the refractory brick to spall. However, the method is time consuming and expensive. Superior campaign life has been obtained through the use of conventional methods, and no evidence to date has been noticed to indicate superior results from slow burn-in techniques. Another method which is used consists of an open gas flame inside the blast furnace. One practice is to install a gas pipe through the tap hole and ignite the gas by a small wood fire maintained at all times. Tuyere openings are equipped with shutters to regulate air input, and the top temperature of the blast furnace is regulated similarly as being done in the two methods described earlier. This method has obvious hazards and hence no more in the use. It is now being regarded as obsolete method. This practice has been superseded by the use of burners inserted through the tuyeres that generate hot air from the combustion of gaseous fuels. Another method used for the drying of the blast furnace, is the use of dutch ovens. Two, three or more furnaces/ovens are constructed outside the blast furnace and the products of combustion from these furnaces/ovens plus excess heated air are directed through pipes into the tap hole and some tuyere openings. Other tuyere and cooler openings are blocked off and draft is regulated by adjusting the bleeders of the blast furnace. As in the drying by the hot blast, the lower sealing valve of the top charging equipment is kept in the closed condition. The dutch ovens are fired with coke, coal or wood and need operators for the maintenance of the fires, hauling of the fuel, and cleaning out of the ash. Temperature control is more difficult in this case, but some regulation is maintained by the intensity of the oven fires and adjustment of furnace bleeders. After the completion of the drying operation, The lower sealing valve and the bleeders of the blast furnace are opened. Blow pipes are taken down and some tuyeres as well as some coolers are removed, if desirable, and paraphernalia around the cast house used in the drying process is cleared. In a relatively short time, the interior of the blast furnace cools sufficiently to permit entering the hearth to prepare for filling. In case a hearth fire has been used for drying, all ashes and refuse are cleaned out. An inspection of the furnace cooling system is now made and water is turned on. It is a normal practice to maintain a constant observation on all the cooling members starting at this time. In cases where the furnace lining is not new and the furnace is empty, this inspection provides a good opportunity to find cooling members which are leaking. Where there is a doubt with a cooling plate or where there is a sign of moisture on cooling plate, then the cooling plate is to be replaced before filling of the blast furnace is started. Also all the mechanical, electrical and physical equipment are to undergo a thorough check before the start of the filling of the blast furnace. Normally a checklist is prepared, and each item of the check list is checked off as reports are received that the item is satisfactory. Work on other preparations have preceded and some continue at this point coincident to the start of the filling operation of the blast furnace. Examples are heating of hot metal ladles, filling of the bins with raw materials in the bins of the stock house according to the prearranged plan, preparation of slag ladles (if used) for service, Inspection of the gas lines of the blast furnace, and opening and closing of the vents as per direction. Steam purging lines are checked to ensure that the steam is available when needed. The iron and slag runners in the cast house are also to be prepared. Simultaneously activities in the power plant for the air blowers are to undergo with equal intensity. May be turbines are to be opened for inspection and numerous preventative maintenance jobs need to be performed. Boilers are to be warmed up, turbo-blowers are to be warmed and turned over, speed trip mechanisms are to be checked, water is to be turned on to condensers, pumps are to be inspected and to be placed in operation, air blast schedules are to be posted and reconfirmed with the blast furnace personnel, boiler water treatment plant are to be started and the switch house and sub-station are to be activated. Some of the final activities before starting up a blast furnace are the installation and drying of the lining materials for the hot metal troughs and runners, setting the skimmers and gates and making certain that the mud guns and tap hole drills are mounted correctly so that they contact the tap hole (iron notch) properly. In some places where the blast furnace is to be operated at very high pressure, the blast furnace is pressurized with cold blast air prior to the start up to determine if there are any leakage which is required to be rectified before charging. There are many different arrangements for placing the start up charge in the blast furnace. Normally it consists of only coke and a small amount of flux below the mantle. Above the mantle there is a gradual increase in the ore burden with a gradual increase in the burden ratio (ore to coke). Very often, wooden sleepers are placed in the hearth at the tap holes so that there is sufficient open space for gas to exit. In some blow-ins, blast furnace slag and limestone are charged with the coke in the bosh region. The purpose of this is that the slag provide a material that will melt readily and carry heat down into the hearth. The purpose of the limestone is to combine with the coke ash and form a fusible slag. To increase the slag volume during the early period of the start up, silica gravel is sometimes added. While filling the furnace with the initial charge ore/sinter to coke ratio is increased toward to top of the blast furnace, the limestone to coke ratio is decreased and the gravel to coke ratio is increased slightly. In calculating the relative amounts of coke, ore burden and flux, it is anticipated that the silicon content of the hot metal in the first few casts will normally contain 2.5 % to 4.5 % of silicon. Consequently, the amount of basic flux must be planned accordingly so that the slag will not be too limy (viscous). As the blast furnace starts to move normally and the hot blast rate is increased, the silicon content of the hot metal will drop and then additional flux must be provided for the silica that remains unreduced in the slag. Several different methods can be used to light the blast furnace. However, the one most commonly used method at present is igniting the coke with the hot blast air. In this method, a relatively low blast volume is first used at a temperature ranging between 550 deg C and 650 deg C and within a matter of minutes the coke present in front of these tuyeres ignites. To use this method, it is necessary to have the hot blast stoves preheated. In a single blast furnace plant or in a multiple blast furnace plant where all of the blast furnaces are off, this may present a problem. Frequently where blast furnace gas is not available, other fuel gases such as coke oven gas or natural gas are used to preheat the stoves until the gas from the blast furnace can be used. Another method, used less frequently, is to place easily combustible material in front of the tuyeres that can be ignited with torches or red hot bars. The natural draft through the blast furnace normally provide enough air to raise the temperature of the coke near the tuyeres to the combustion temperature, and then a light flow of blast air can be started. Before the blast furnace is lighted, the gas system is isolated from the furnace by a goggle valve, normally located downstream of the gas cleaning system. The gas cleaning system is purged from this goggle valve to the blast furnace with steam or some inert gas. During the early stages of the blow-in, the bleeders at the top of the furnace are kept open and a purging gas is kept in the gas cleaning system up to the valve that separates the gas cleaning system from the main plant gas system. Gas cleaning systems may vary from blast furnace to blast furnace, and sometimes separate sections of the gas cleaning system are isolated from one another and purged separately. In many places, there is no isolating valve between the dust catcher and the blast furnace and, hence, the dust catcher is purged with steam that is vented through the blast furnace down comer and discharged through the blast furnace bleeders. When the hot blast rate at the blast furnace has been increased sufficiently to maintain a good, steady flow of blast furnace gas, the purging medium is shut off and the bleeders are closed. When a positive pressure of gas is obtained up to the isolating goggle valve, it is opened and the gas is allowed to flow into the main gas system. Significant precautions to avoid an explosion must be taken throughout this period, and the area around the blast furnace, the gas cleaning system and the valves must be monitored for potential leaks of blast furnace gas. When the blast furnace is started up, the hot blast rate is only a small fraction of what it is to be at normal operation. Hence, it is necessary to open only a few of the tuyeres so that the velocity through each tuyere is sufficient to carry the hot blast well into the blast furnace and to prevent the hot gases from channeling up along the walls. This is normally accomplished by plugging the tuyeres that are not being used with clay balls and poking them open later as the hot blast rate is increased. In some cases, bushings are placed inside the tuyeres to decrease the diameter of the opening during the early stages of the blow-in. These bushings are then knocked out when the higher hot blast rates are to be used. At first the hot blast rate is increased every few hours so that by the end of the first 24 hours, it is around 40 % to 50 % of full hot blast. After this, it is increased roughly 25 % per day until the ultimate rate is attained. When the blast furnace is started, the tap hole is usually left open, and some of the gas generated by the combustion of the coke exits through the tap hole. At first, this gas must be ignited, but as the hot blast rate increases, it heats the coke in the hearth and ultimately discharges at a temperature high enough to remain lit. The tap hole generally remains open until slag begins to appear. This is indicated by a decrease in the gas volume and a puffing or pulsation at the tap hole. When this occurs, the mud gun is swung into position and the tap hole is closed. Every few hours after that, the tap hole is reopened to remove any slag that has formed. On bigger blast furnaces with more than one tap hole, normally a different tap hole is opened with each successive attempt. Within approximately 24 hrs to 28 hrs after start up, the first hot metal is expected to be cast. This hot metal is typically be very high in silicon content because of the slow operating rate and the high ratio of silica to iron oxide in the raw materials in the first portion of the blast furnace charge. As the hot blast rate is increased, and the burden ratio (ore to coke) approaches the normal operating level, the silicon content of the hot metal decreases. Accordingly, the ratio of flux to the other raw materials is to be adjusted to provide sufficient basic oxide to flux the unreduced silica that goes to the slag. Generally, during the blow-in period, it is advisable to keep the burden ratio (ore to coke) in a range that produces high temperature hot metal at around 1500 deg C to assure that some unforeseen problem will not result into a freeze up. The hot blast temperature is generally not raised to the maximum output of the hot blast stoves during this period, since there is a need to have a reserve available that enables the introduction of additional heat into the hearth in case of an emergency.